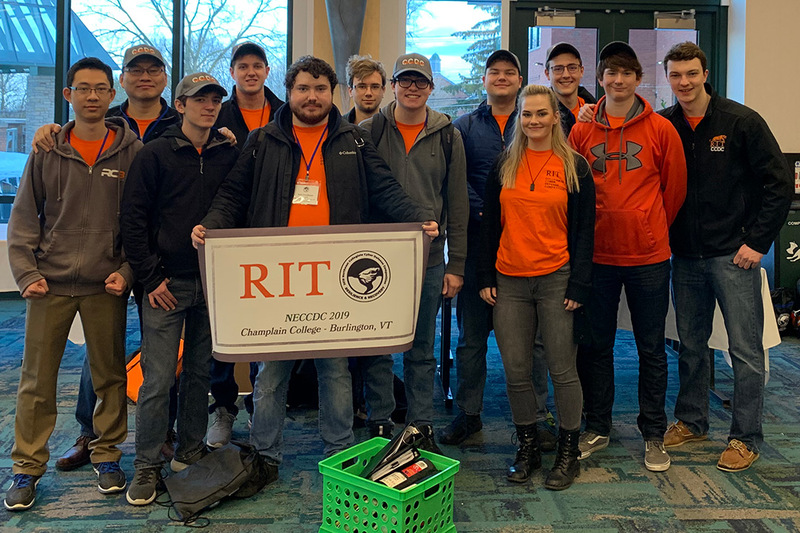 : RIT took first place in the 2019 Northeast Collegiate Cyber Defense Competition. The win gives RIT an automatic bid to the national tournament April 23-25 in Orlando. A team of Rochester Institute of Technology cybersecurity students is heading to the National Collegiate Cyber Defense Competition (NCCDC) after taking first place at the regional competition March 15–17. Ten teams competed in the event hosted in Burlington, Vt. Northeastern University placed second and Champlain College placed third. The win gives RIT an automatic berth to the 2019 national competition (NCCDC), held April 23–25 in Orlando. The annual event is part of the nation’s largest college-level cyber defense competition, an extracurricular event that helps to train the next generation of cybersecurity experts. The competition gives student teams the opportunity to assume responsibility for the information technology operations of a simulated organization, allowing them to apply cyber defense skills in a real-world scenario. RIT’s cyber defense team is a perennial contender at the regional and national competitions. The Tigers placed second at regionals last year. RIT also placed third at the national competition in 2015, second in 2014 and took first place in 2013. For the competition, a group of industry professionals from government and companies—called the red team—is assigned to break into computer networks to exploit information from a mock company. Teams of students are “hired” by the company to prevent that information theft from occurring. The theme this year was “resilience and recovery,” where teams had to respond quickly and effectively when disaster struck. Assistant coach of the RIT team, Joe Graham, said that this scenario worked well for RIT, as the team has built up a reputation of being able to recover from disaster over the years. Other participants in the regional competition included Champlain College, Harvard University, Northeastern University, St. John’s University, SUNY Albany, Syracuse University, University of Maine, University of New Hampshire and Westchester Community College. At the event, students also had the opportunity to network with professionals who are currently working in the cybersecurity field. Brandon Adler, captain of the RIT team, said that he loves competing in cyber defense competitions because they provide a level of learning that cannot be achieved by other academic methods. The RIT student team is made up of Adler; assistant captain Russell Babarsky, a fourth-year computing security student from Fairview, Pa.; Phillip Babey, a first-year computing security student from Newark Valley, N.Y.; Amanda Brown, a second-year computing security student from Wyalusing, Pa.; Robert Gray, a second-year computing security student from Canandaigua, N.Y.; Sean Newman, a third-year computing security student from Fairfax, Va.; Connor Shade, a third-year computing security student from Jersey Shore, Pa.; Duc Phan, a third-year computing security student from Vietnam; Simon Buchheit, a second-year computing security student from Marysville, Ohio; and Jack McKenna, a first-year computing security student from Saint Paul, Minn. The RIT team is coached by Bo Yuan, professor and chair of RIT’s Department of Computing Security, and assistant coach Graham. Nine more regional winners will be determined before the National Collegiate Cyber Defense Competition in April. For more information, go to nationalccdc.org. “I’m extremely proud of how professionally and quickly our team worked under the stressful conditions and hope to bring a good fight to the Nationals competition,” Adler said.